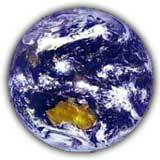 Permaculture is an ethically based system for designing sustainable lifestyles. Wherever you live you can, by applying the principles of Permaculture Design, working with, rather than against nature, actually improve your quality of life, while reducing your impact on the eco-system of which you are a part. Permaculture Design selects those elements which best work together to create stable & productive eco-systems in a particular location. On large properties Zone 5 (the area furthest from human habitation) is set aside to protect existing wild eco-systems, or actively re-vegetated. In urban situations the scope for such projects is usually limited to public land. As a design system, Permaculture is unashamedly anthropocentric, but designers prefer to work in co-operation with existing natural elements, rather than in competition with them. Because I am a Deep Ecologist I also respect & do all I can to address the needs of all living things in this little sanctuary. There is no such thing as a typical Permaculture Design. And as a Design system, Permaculture is applied to your entire habitat, not just the garden, & to the way you live. People without gardens can still make their dwellings & their lifestyles sustainable using the principles of Permaculture Design. In designing for my tiny home & garden, (less than 150 sq.metres of soil, the cottage 50 sq.metres in area including the porch- the rest is concrete!) I did my best to provide for my non-human fellow inhabitants. Nor is this totally altruistic - in return for water, food, shelter, & protection, they provide fertiliser, pest control, & endless diversion. Wild creatures certainly do some damage, especially in times of drought, but nothing compares with what people have done, & continue to do, to their rightful domain. To re-earth our cities we need to do whatever we can to accommodate the original inhabitants. I also aim to make a visible 'statement' of greeness & wildness in a built-up environment. Click links to access illustrations, backspace to return here. Many photos were already on the website, but I took new ones of the front on 27th.April 2011, and a few more in January 2012, to show the more dramatic changes. 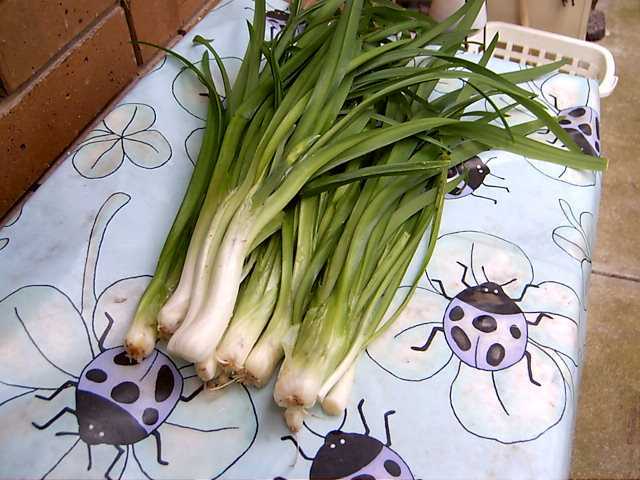 The site includes a detailed plant list which I try to keep fairly up-to-date. This small detached property was newly-completed when allocated to me by the SA Housing Trust in July 1989, giving me a clear start. The design & location of the property presents a number of challenges that compromise sustainability, personal comfort, privacy, & security. As a Trust tenant I have tenure, & a controlled rent, but cannot alter any part of the permanent structure to make it more sustainable. The challenge was to demonstrate what can be achieved using the Principles of Permaculture Design. The house is only 45 square metres in area, & the rooms are small, with low ceilings; so the 5 square metres of glass facing South-west can make the place unbearably hot in summer, & leaks much of the interior heat in winter. Pollution from road dust & vehicle exhaust is a constant problem, so are noise, & both light & visual pollution. The 150 square metres of garden soil/landfill was of reasonable quality even when unimproved, & subsoil moisture is partially maintained by irrigation water from a school oval to the SE, which flows through it back to the river. Since the garden is small & closely surrounded by other properties, & the beds narrow, few parts of it receive full sun for long, especially in winter. Yet home food production was originally as much a priority in the design as sustainability, climate modification, & the improvement of general living conditions. The obvious Permacultural solution was to select & plant suitable trees, cover the fences with vines, & fill the spaces with shrubs & perennials. This does not, even now that the most of the trees are mature, preclude the production of small quantities of biennial & annual food plants. I raised the height of the front fence using a trellis made of mattress springs. This discourages cats, provides a measure of security, & ample vertical space for screening plants; these give privacy & provide some protection from the dust & exhaust fumes generated by passing traffic. 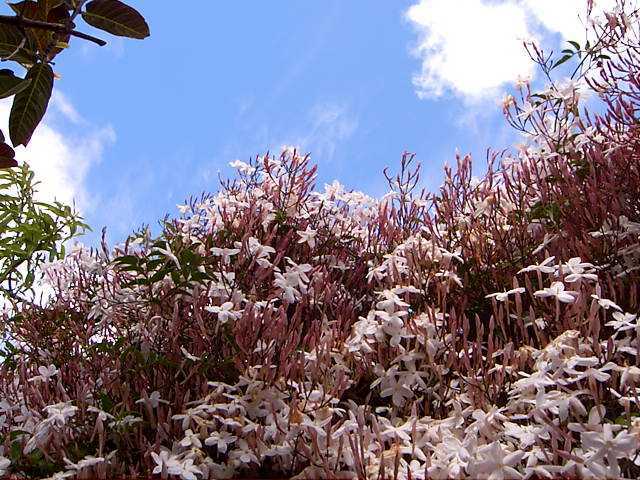 They also provide habitat for several species of small bird and a wide variety of insects. The use of mattress springs is a recycling talking point. The permanent plantings have now successfully reduced the impact of many of the original problems. My aim of living as sustainably as possible within an urban context, on a limited income, while coping with the chronic health problems that resulted in my being allocated a Trust property, has been largely achieved. I continue to make changes & experiment with simple practical strategies to further reduce my ecological footprint, while maintaining a reasonable degree of personal comfort. Advancing age, & the changes that take place in the immediate locality, constantly present new challenges, & require strategic responses. This apparently quiet & secluded spot is in fact quite dynamic & full of human activity - much of it mechanised and noisy! Recently I've been criticised & even harassed by campaigners for native Australian plants, because I still grow Agapanthus, Tradescantia, Periwinkle, & Nasturtiums! I make no apology for this. 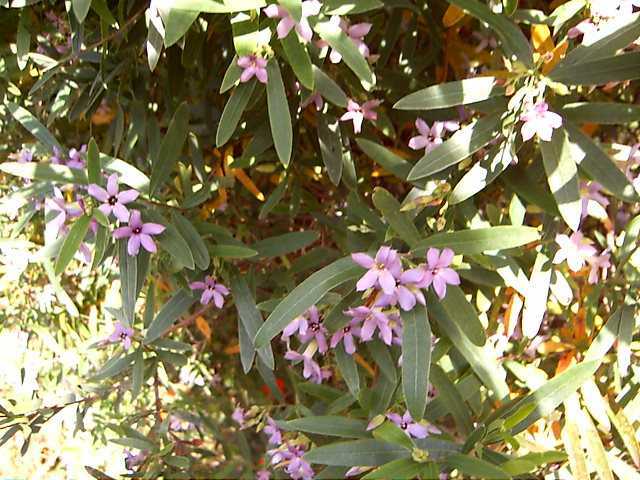 Anyone who is familar with my plant list will realise that I use Australian species whenever appropriate. There are places where they either won't grow successfully, or don't have the characteristics to do a specific task. Of the almost 50 trees, shrubs & vines on the property, more than 30 are native species, & more than half of these are indigenous to the Adelaide Plains. But so-called "weeds" also have their place in the system. 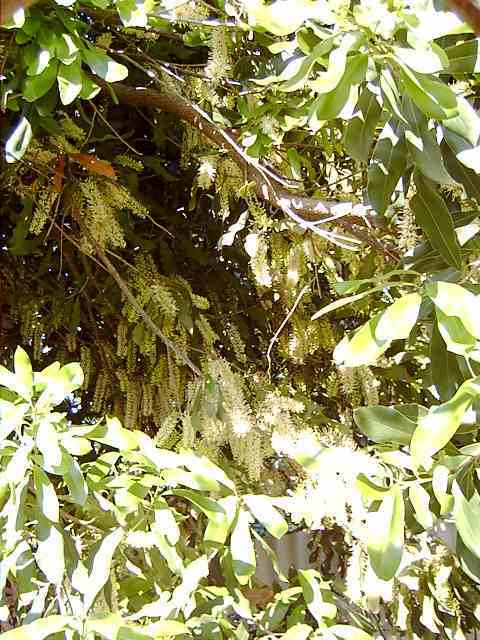 One of the outstanding pleasures of the garden is the succession of wonderful scents throughout the year - the flowers of Wattle, Loquat, Peach, Macadamia, Almond, and citrus ssp. 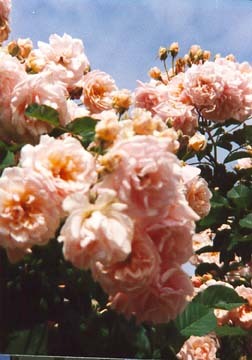 are all heavily scented, as well as the more obvious perfumes of rose, honey suckle, and jasmine. At times the sound of the bees is audible inside the house! And I always wake to the sound of birdsong. The recent 4-year drought, & consequent water restrictions led to the loss of some of the annual self-seeders & water-loving groundcovers, as well as the ageing passionfruit on the SE portion of the front fence. But the design as a whole withstood the lack of water extremely well. 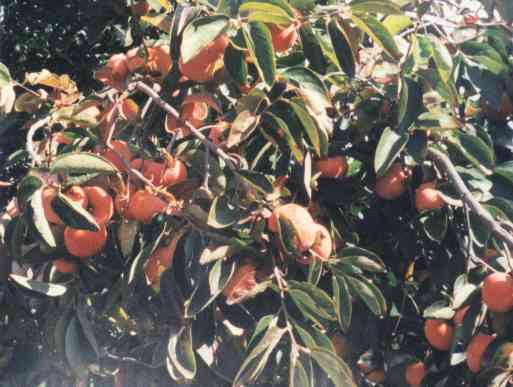 Extraordinary rain during the spring and summer of 2010/11 has resulted in rampant growth & huge crops of fruit & nuts. The grapes succumbed to downy mildew, but they were still relished by the birds! The Front - Aspects NE and SE, visible from the lanes. Outside the fences & at the entrance I have piled up the soil & dust from the street, & as well as allowing climbers from the garden to layer into this, I have planted various suitable tough perennials, & encouraged those weeds which do a good job of stabilising the soil & reducing dust. They also provide food & habitat for birds, a variety of insects, including butterflies & their larvae, & cover for blue-tongued skinks. 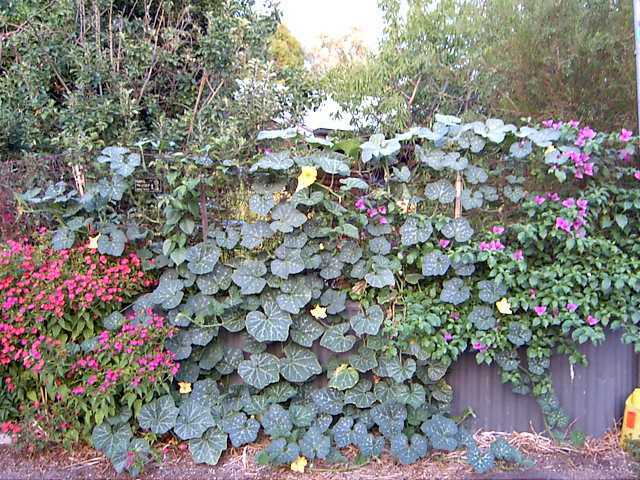 Self-sown Nasturtiums appear annually to brighten the street in winter. And I have recently established a small area for native plants & grasses well away from the road, but where they can still be easily seen. 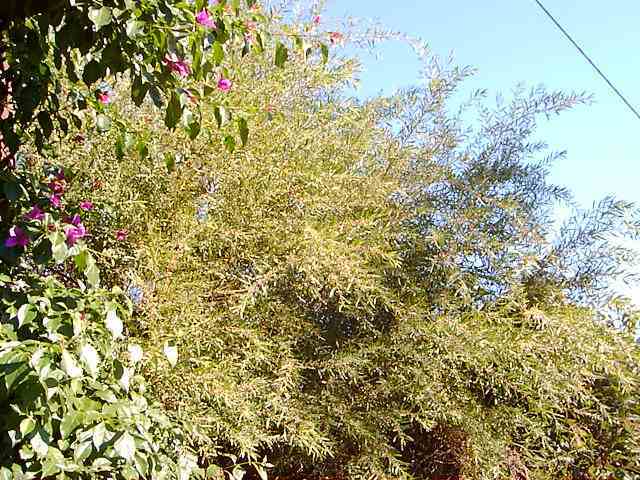 A Sparrishoop rose grows in the narrow bed in front of the portion of wooden fence on the NW. The greenery gives a much-needed safety margin of some 30cm.for the fence, which is extremely vulnerable to vehicles manoevering in the narrow lane, by encouraging drivers to focus on it, instead of the fence. 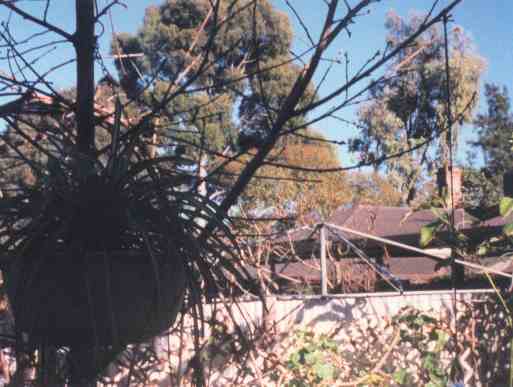 The plants also disguise the damage which has occurred over the years, & discourage people from using the unfenced entrance as part of a turning-circle, thus protecting the corner of my lounge-room which is completely unprotected, & like the rest of the cottage, only 2 metres from the carriageway. 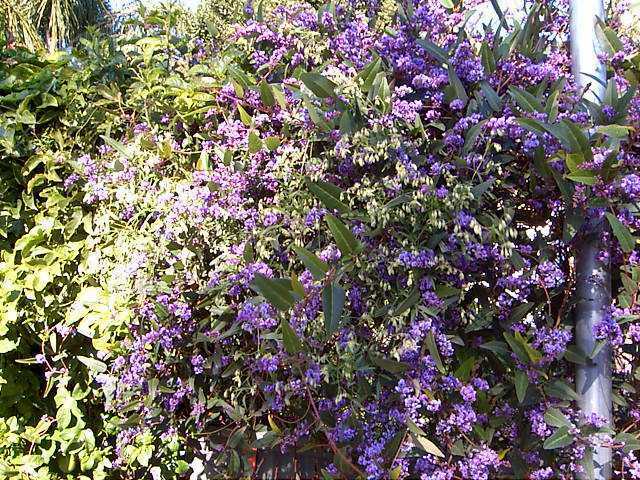 The upper portion of the 'fence' is covered with perennial climbers - Muehlenbeckia Adpressa, Hardenbergia, native clematis, appleberries (Billiardia ssp. ), ivy-leaved geraniums, & Bouganvillea, which was planted to replace the passionfruit. In some years I sow pumpkins as well. All these are planted in the garden itself, up against the fence. This entire area is a practical example of the richness of edge, which encourages soil-building, irrigates by condensation, & receives plenty of natural fertiliser. The front garden now holds almost as many trees, shrubs, perennials & groundcovers as it will support naturally. All are productive in some way, whether for human food, habitat & food for wildlife, perfume, kindling, mulch, & firewood. I also grow a number of plants, mainly herbs, in pots, to take advantage of the many sunny spots on the concreted areas. Arches over the path from the gate support a Felicia rose, winter & summer jasmines, & a 7-year bean. The combined scent of roses, honeysuckle, & jasmine, especially in the early mornings & evenings, is exquisite. In season I can harvest rosehips; appleberries; beans; a variety of culinary herbs; greenstuff from dandelions and other edible weeds, nasturtiums, & sweet potato tops; Queensland arrowroot; sweet potatoes; Guavas; wattle seeds; jasmine flowers; perennial leeks; 5 varieties of apple; persimmons; Washington Navel oranges; & macadamias. I haven't succeeded in saving my almonds from the birds for years, but the flowers are a delight, & provide food for several kinds of honeyeater! The trees & shrubs keep the area cool in summer, sheltered in winter, and provide privacy, shade, beauty, sweeten the air, reduce unwanted illumination from outdoor lights on the units opposite, & the streetlight on the corner of the block; give me a pleasant outlook when I'm working at the computer or sewing machine; & create at least the illusion of peace. The Back - Aspects SW AND NW, treetops visible from the lanes. The block is raised about a metre from adjacent levels on the SW and NW. Thus, since the entire outer wall of my main room consists of glass patio doors, there is an unavoidable line-of-sight through to the SAHT car park a street away. After dark, glare from it's lamps, from several surrounding street lamps, & from outdoor lighting on adjacent properties, used to flood my home with unwanted light at night. Unscreened, the view at eye-level is mainly of roofs, TV aerials & air-conditioners, & although there is a backdrop of distant trees, the photo doesn't give the same perspective as the eye - they actually look much further away. Also the largest of these has already been felled, so I don't take these, or any trees not on my block, for granted! These glass doors are the main source of light & ventilation, as well as the only back entrance, so permanent blinds would be extremely inconvenient, & block the rear exit in an emergency. The utility room window also faces SW, so a total of 5 square metres of glass on the SW of the house are in full afternoon sun for many hours each day at the hottest time of year; while the prevailing winds from the West and South-West in winter used to drive rain against the glass which ran down into the house; the glass, being an excellent conductor of heat, as well as transmitting light, lets in all the heat in the summer, & out in the winter! (In contrast, the NW wall is solid & has no windows to let in the winter sun!) Altogether the worst posssible aspect for energy efficiency. So I selected mainly evergreen trees for this part of the garden, to provide shade; give a pleasant outlook; filter or screen out unwanted artificial light & depressing views; & protect the house from rain & wind. They make little difference to the light in winter, as the sun doesn't get round that far anyway. 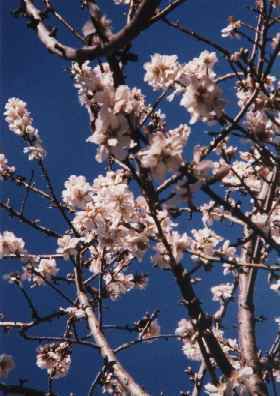 But the deciduous peach tree & the Sultana vine, which also shades the NW wall, give extra summer shade. I replaced the water feature that used to form the centrepiece of my 'living picture' - which is what I can now call that huge expanse of glass - with a large blue ceramic globe. (A gift from my family & local Permaculture group on my 65th. birthday) It was an unwarranted use of both power & water, & the 'quiet' pump surprisingly noisy. The understorey plants beneath the trees here are mostly ornamental shade lovers, but the birds, possums, & bluetongues use it as a hunting ground, so from their viewpoint it's far from merely ornamental! The central tree, looking SW is the Mandarin. 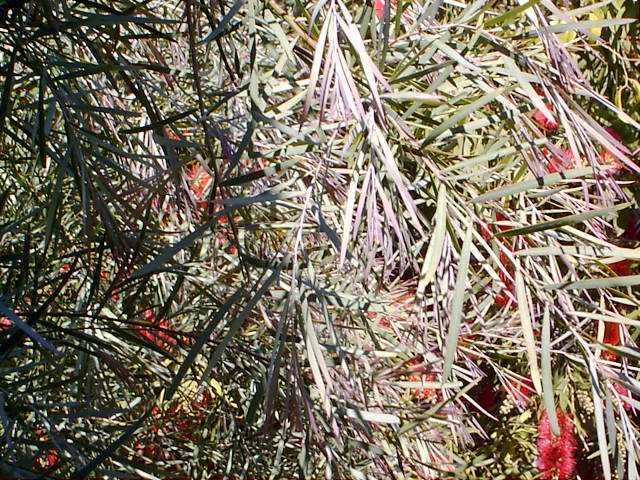 Looking West, I see the peach; grevillea; wattle'Acacia Fimbriata' and bottlebrush 'Callistemon Gawler hybrid'; & the grapevine. Looking East, I see a feijoa; two appleberries; &until recently, the avocado, which almost hid the largest rainwater tank. In another year or so I will also be able to see the Loquat, which has replaced the apricot tree killed by Rainbow Lorikeets & possums during the drought. In the extreme SE are the fig, the lemon, & a Valencia orange. I've recently established more ornamentals near the outdoor bath, which is back in it's original position under the eaves. The Northern portion of the area on the NW, originally the driveway, is the only part of the garden which gets reasonable sun all year round without being exposed to the pollution caused by traffic, or being needed for large shade plantings. I've often grown good crops of summer vegetables here, & this year used a number of old recycling bins as raised beds for root vegetables. Parsley, wild garlic, Flame Flower - a perennial member of the portulaca family with large edible leaves - & some very fine dandelions, nettles, milk thistles, & chickweed grow wild. 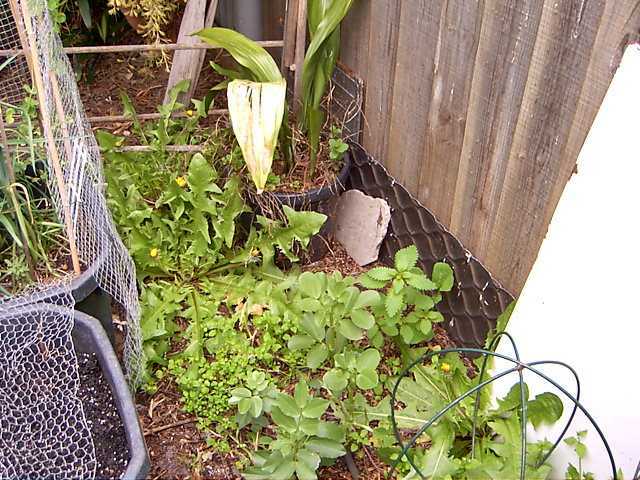 Jerusalem artichokes & sweet potatoes usually give good crops in winter. 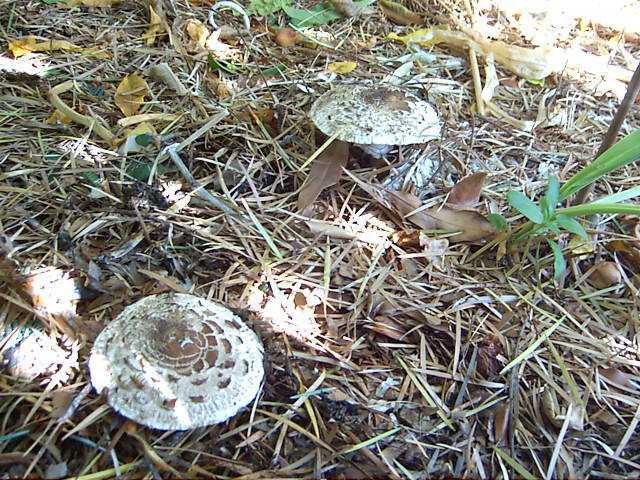 This Autumn I'm currently gathering useful numbers of parasol mushrooms from the leaf litter under the trees. 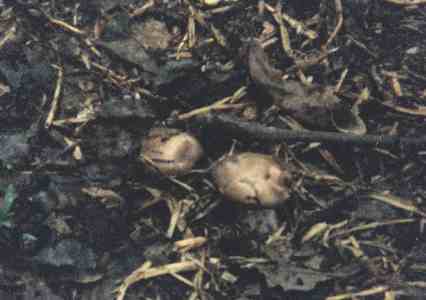 Edible fungi often appear spontaneously in this humus-rich, relatively undisturbed soil. In some years I've had small crops of field mushrooms, and once, quite inexplicably, some wood blewetts. Most of the contents of both house & garden consists of recycled or discarded items - there's no such thing as rubbish, only resources! Every portion of outdoor space is put to use. The twin-tub washing machine lives, all my laundry is done & the washing dried, in the garden. I collect, cut up, season & store firewood for my small but efficient Franklin stove throughout the year, have three rainwater tanks, & as many other receptacles as I can find for rainwater storage. 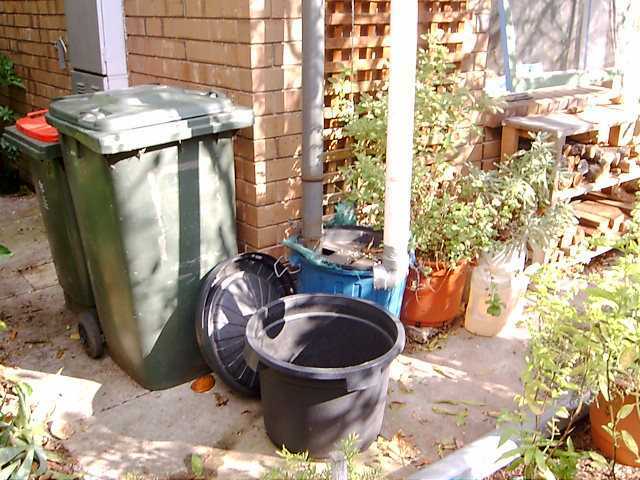 There are two compost bins. Prunings are mulched by my indispensable gardener, who now takes much of the heaviest work off my hands. During winter I sometimes also collect & store leaf mulch from surrounding streets. Most space on the porch & under the eaves is storage for tools & the many useful items I keep for seasonal, or collect for future, use - e.g.lengths of ag.pipe, solid drainpipe & guttering, pieces of shadecloth from 1 metre square to enough to cover the driveway (the least shaded part of the garden, therefore the best place for vegetables) in a heatwave, cane blinds, tarps in several sizes, tiles, bricks, buckets & basins, plastic bottles, oddments of hose, several trolleys, large Mao baskets, sacks & rubbish bags, & an old pram I use during the hard rubbish season. I only move or disturb these items when absolutely necessary, as they are inhabited by a diversity of small creatures, including several kinds of gecko, spiders, leopard slugs, eggs & pupae of many kinds. My policy is one of non-interference & minimal disturbance, & I move around the place with great care so as to upset as few of my fellow-inhabitants as possible. I haven't used my gas water-heater or the gas-stove, both over-large & poorly located, for many years. I don't want a conventional solar HWS - it would require too much water, and probably have to be connected to the mains. In summer I use a number of simple methods to heat water and cook foods such as grains & pulses, in the sun. In winter the Franklin stove does the same. The three rainwater tanks, totalling 5,800 litres, & when they are full I collect rainwater in everything available! The soil is mulched & full of organic matter & plant roots, so retains all the rain that falls on it. Grey water is used on the trees & shrubs, & to flush the loo. I use only rainwater in the house, & the taps & drains are simply not used. Since I cannot have my tanks plumbed in, & use all my grey water, most water is shifted in buckets! Carrying weights is good for ageing bones, & I get all the exercise I need without going to the gym! I usually use mains water only for the garden, & then only between Christmas & mid-March. In 2007 and 2008, I didn't turn off the mains tap until Anzac Day (25th.April). 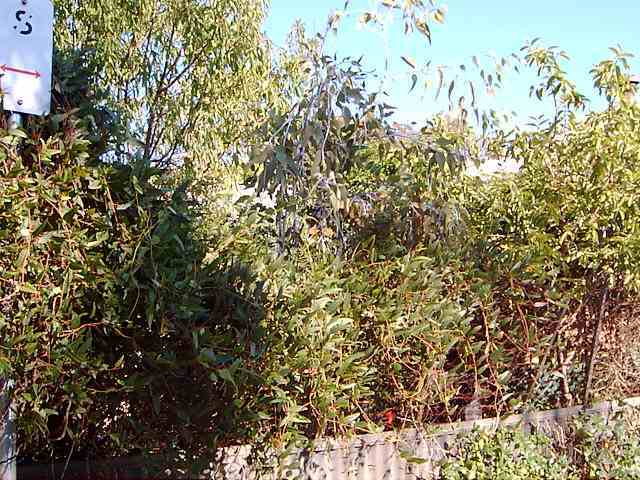 In 2006 I still managed to get through until Christmas, & in 2009 until two weeks before, when I planted out more screening shrubs at the front, having learnt the brush fences opposite were to be replaced by colorbond. I have deepwatering stations all round the garden, & use soft drink bottles to service them. So a very little water goes a long way, though it's labour intensive. Just occasionally, when I'm really tired I still use the leaky hose which I installed some years ago all round the garden. Pots are always watered with rainwater. Well, it has! 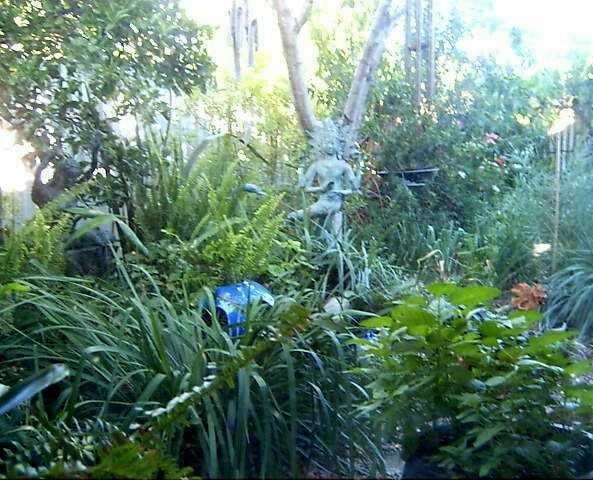 And in January this year (2012) my garden was, frankly, a dispiriting mess! 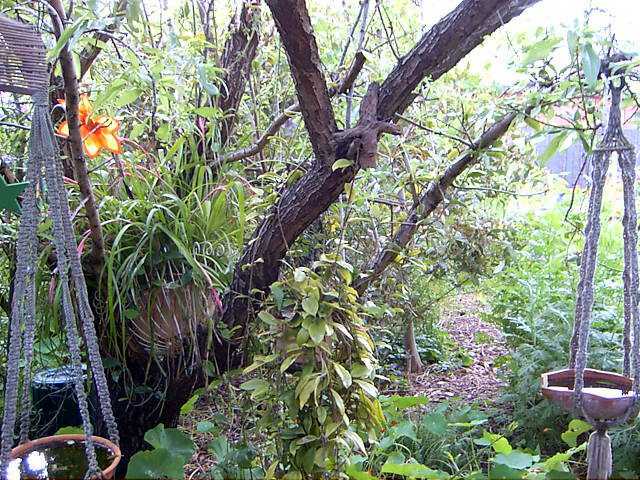 Apart from the loss of the Avocado tree, which has changed the entire ambience of the garden, the the removal of two large old trees, a Pear and a Silky Oak, from a nearby garden, meant that yet another possum took refuge in the garden. The damage has been widespread. Not only was all the Almond Blossom eaten this year, but the foliage has been reduced to lace!